Of a distinctly different shape, the Marbled Hatchetfish grows to 1.5 inches. They occupy the upper area of the tank and can easily jump from uncovered aquariums. Like all hatchetfish, they should be kept in a group with quiet, placid tank mates. Living Environment : They will also appreciate tall plants with broad trailing leaves where they can find some shade. Neon Tetras are very similar to Cardinal Tetras but have been available to hobbyists for a good while longer. Perhaps the most popular of all aquarium fish, Neon Tetras grow to a little over an inch in length. Living Environment : They should be kept in shoals with other small, peaceful species, and they take all flake and freeze-dried foods. As with the Cardinal Tetra, a dark tank with subdued lighting enhances the colors of these fish. A member of the large, popular cichlid family, the Orange Chromide grows to about 3 inches and fits comfortably in most community tanks. Although a hardy species overall, very small individuals are sometimes susceptible to fungus in pure fresh water. Living Environment : All flake and freeze-dried foods are accepted, but Orange Chromide will nibble on live plants if they don't get fresh vegetable food regularly. Adding a teaspoon of salt for each gallon of water eliminates the problem, but some hobbyists believe that certain tank mates, such as catfish species and Angelfish, do better without salt. The Paradise Fish was the first tropical aquarium fish imported into Europe about 150 years ago. This fish grows to 4 inches and should not be kept with any small species. Like bettas and gouramis, it is able to take air directly at the surface of the water because of a respiratory organ known as a labyrinth. Living Environment : All flake and freeze-dried foods are consumed, but an occasional feeding of blackworms should also be offered. The Pearl Gourami grows to 4 inches. Its deep body is heavily peppered with shimmering silver spots that extend into the fins. This beautiful, peaceful fish does best when kept in pairs a male and a female. The Pearl Gourami should not be kept with aggressive tank mates. Living Environment : A variety of flake foods with high vegetable content and freeze-dried foods should be offered. The tank should be spacious, with lots of plants and subdued lighting; floating plants can help to provide areas where the light is diffused. The Penguin Fish grows to 2 inches and does well with other fish that are small and peaceful. The female tends to be larger and has a fuller body. 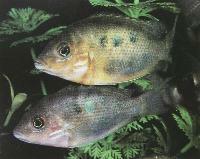 Living Environment : This species will not do well if the water quality begins to deteriorate. The Penguin Fish eats all flake and freeze-dried foods. This South American species inhabits several river systems of Brazil. Able to grow to 6 inches in length, the Pictus Cat should be kept in a tank with subdued lighting and several hiding places in the aqua capping. An active species, this fish can be kept alone but makes a nice display in a small group. Living Environment : The Pictus Cat will eat pellet, tablet, flake, and freeze-dried foods, but it should be fed at night. This catfish will chase and eat almost any fish that are small enough to swallow, so it's not suitable for all community aquariums. The Platy is a popular beginner fish, since it is relatively sturdy, easy to care for and also easy to spawn in captivity. 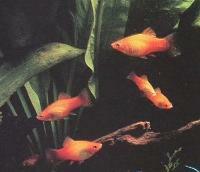 A popular, hardy species, the Platy grows to 2 inches and is available in a wide variety of colors. As with all live-bearers, they will breed freely in a community tank, but the young are almost always eaten by tank mates. Living Environment : All flake and freeze-dried foods are eaten, but flake foods high in vegetable content must also be provided. Small amounts of algae in the tank will also be eaten. The Red Rainbowfish reaches a length of six inches and does best in groups. This deep-bodied species requires a large tank with both swimming space and planted areas. The Red Rainbowfish hails from Papua New Guinea. Females are a soft, pale golden color, while the males are a fiery red. As with the Dwarf Rainbowfish, males show a bright yellow blaze on the forehead during courting. Living Environment : Although it will accept flake and freeze-dried foods, live foods such as brine shrimp or blackworms should also be provided. The Red-Eye Tetra is one of the larger tetras, growing to 2.5 inches. It is an undemanding species as long as the water quality is good and there is room for a group to swim actively in the tank. The Red-Eye Tetra is a fin-nipper, though; keep it with short-finned companions that are the same size or a bit larger. Living Environment : Flake and freeze-dried foods are fine, although an occasional feeding of live brine shrimp is recommended.